In building services, KSB's comprehensive solutions make for reliable and highly efficient air-conditioning, heating and ventilation. Our optimised Etaline PumpDrive heating pump and the zero-maintenance BOA-Compact globe valve are a case in point. 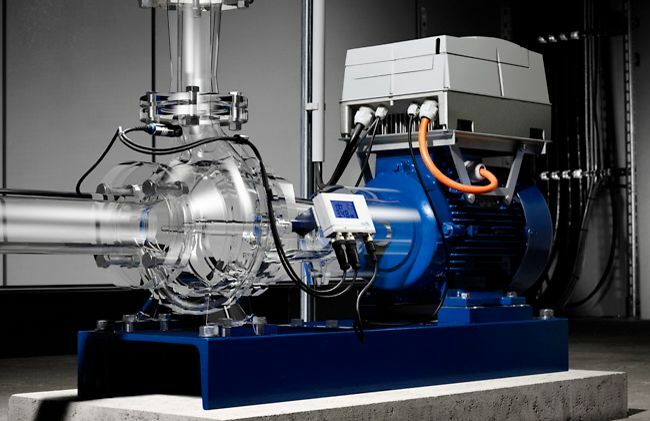 KSB pumps like this heating pump, with impellers, motors and variable speed systems matched to the actual duty point required, are perfectly suited to temperature control applications. And KSB also supplies the requisite valves with automation options to match, plus comprehensive service. The new Etaline-R in-line pump is available in 14 sizes to suit large HVAC applications. The optimised flow geometry of BOAX-S/-SF butterfly valves reduces energy costs in heating and sanitary applications. KSB Riotronic P achieves considerable energy savings in buildings' heating requirements. It is easy to install and offers reliable and transparent operation. Etaline PumpDrive is a close-coupled heating circulator pump with motor-mounted PumpDrive variable speed system.